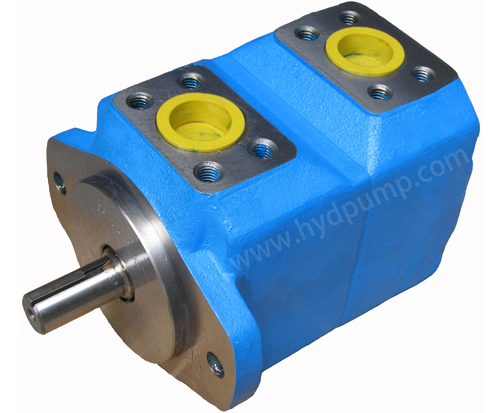 Vickers high performance vane motor, when properly installed in a hydraulic circuit, convert hydraulic power into rotary mechanical power. They are positive displacement, balanced cartridge units, with drive speed dependent on the motor size and gpm delivery to the inlet port. The units are capable of operating at high speeds and high pressures, or higher speeds at lower pressures. 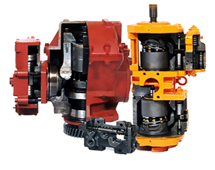 These motors may be operated in either direction of rotation, reversed or stalled under load conditions without damage. All motors covered in this manual are basically identical in construction. The motors are designed so that the maximum torque capability can be changed within a series by changing the cartridge or the cam ring. The Vickers vane motor is body face mounted, or are available with an optional foot mounting the body mounting is a standard SAE 2-bolt type. 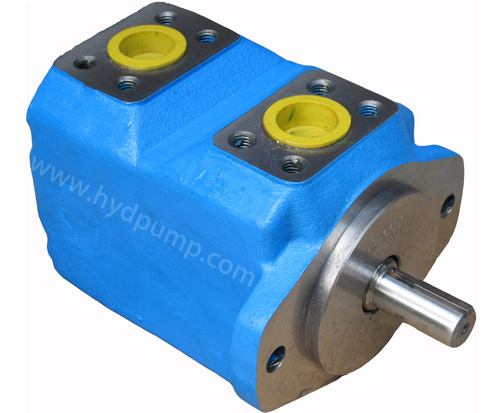 The unit consists principally of a body, cover, drive cartridge and shaft. Rotary motion is developed in the cartridge, which principally consists of a ring, rotor, ten vanes and two pressure plates. 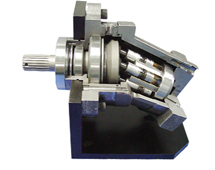 The rotor is spline and mates with the output shaft, which is supported by a ball bearing in the body and a bushing bearing in the cover pressure plate. The vanes slide radically in the rotor slots and follow the elliptical cam contour of the ring as the rotor turns. These vanes are held against the ring by a combination of spring and centrifugal forces. Port connections are located in the body and cover. Direction of shaft rotation is governed by the direction of fluid flow through these ports. Pressure is sealed from one port to the other by a Teflon sealing ring in the body on the periphery of the ring. Drainage is ported through an external connection in the cover. The cartridge is bolted together and can be serviced as a complete assembly. Locating pins position the ring with respect to the pressure plates, and in like manner, two torque pins position the cartridge in the cover. The cover can be assembled in four positions with respect to the body. Changing of the port positions is accomplished by rotating the cover and cartridge. 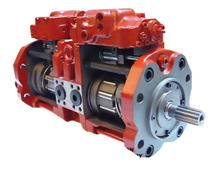 Replaceable cartridges permit vane motor overhauls in just 10 minutes - in the field, a cartridge can be replaced without removing the unit from the vehicle, and usually without disconnecting hydraulic lines. Inlet and outlet ports can be pressurized simultaneously without affecting service life or operating smoothness. These motors are suited to series applications. See note below table on page 104 regarding pressure / rotation of model series 50M. Vickers vane motor has field-proved these high performance motors over many years. 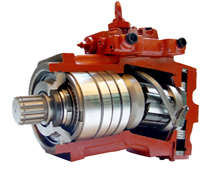 They have been overwhelmingly successful on elevator scraper drives, hydrostatic drives and many other auxiliary applications. Vickers’ exclusive dual-alternate pressure plate design provides overall efficiency of about 86%.